On March 22nd, the Cincinnati Museum Center will welcome guests to return to The Cave, one of the most beloved exhibits in the Museum of Natural History & Science. Sealed during most of Union Terminal’s massive two-year restoration, The Cave has now been thoroughly cleaned and updated, with a new interpretation center to add to the experience. Opened in 1989, The Cave is a winding underground replica of a Kentucky limestone cave. It was fabricated from mostly concrete with real fossils embedded in the walls and fabricated formations “growing” throughout. The Cave is a truly immersive exhibit, taking guests on (what feels like) a real trek underground. There are two levels to the cave. The upper level is wider, more physically accessible, and better lit. The lower level has a more winding path with narrow passages, water features, and darker tunnels. Visitors can take one or both, in turn. Dave Might is an exhibits coordinator and artist preparing The Cave for its reopening. He says the exhibit is all based on rural Kentucky geology and was designed after a specific cave in Rockcastle County, Kentucky. The original designers took molds of the rock walls at the cave and cast them in concrete for the exhibit. The mural at the cave’s entrance, he says, shows the actual location as it is visible off of I-75. 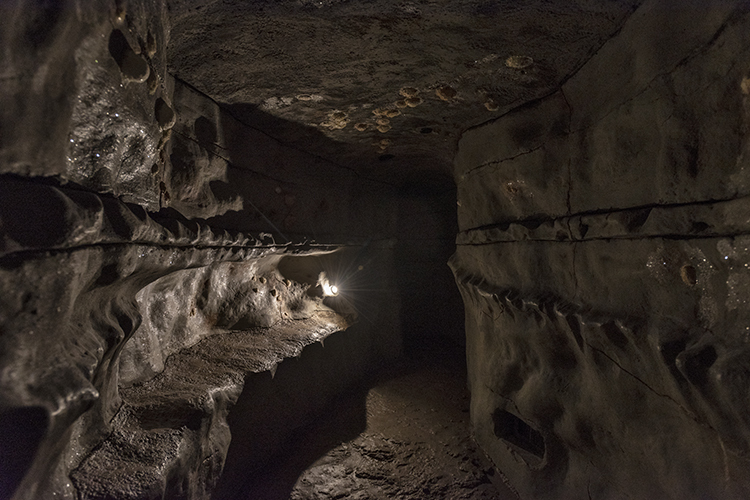 In addition to the parts fabricated on site, some of the rock formations were borrowed from the old cave at the Cincinnati Museum of Natural History that was located near Eden Park until 1990. Just as in real life, The Cave is dark, damp, and chilly. Along the route, in box display cases built into the walls, visitors can find things often seen in caves — cave-dwelling rodents, insects, amphibians, rock formations, fossils, etc. Might says that he and the other artists take special care to create an authentic experience, even down to the details of model insects and rock formations. He personally creates molds off of real artifacts like cave crickets and crayfish. Real fossils are embedded in the concrete. The animals represented in the display boxes are significant as they reflect the scientific research done in caves today, with animals such as the Allegheny Wood Rat. All the animals present in the cave, Might says, are animals that would be seen at the entrance to a cave — cave salamanders, crickets, bats, etc. “When we first opened [the cave], the designers wanted it as much like a real cave as possible,” he says. The lower level has a winding path with narrow passages, water features, and darker tunnels. The Museum of Natural History & Science was closed to the public for much of 2016–2018 while Union Terminal received a massive restoration overhaul. During that time, museum staff took the opportunity to redesign the entire museum experience, including The Cave. Rachael Kroth, assistant exhibits designer, explains that the goal was to round out the visitor experience of The Cave. The first change visitors will notice is that the area outside the cave exhibit has been completely rebuilt. It includes an updated bat flight area and a new sitting area — the Cave Lounge — where visitors can rest before transitioning into The Cave or the neighboring Ice Age exhibit. The new interpretive center guides visitors through a much more detailed exploration of the science of caves than the previous exhibit had offered. It’s a completely modernized exhibit with both digital and analog displays. Visitors will learn about local cave systems, see examples of local rock specimen, watch digital projections, and learn about the things that live and grow in caves. One highlight of this new exhibit is a commissioned bronze model of the Mammoth Cave system made by local artist James Hermann, who also worked on some of the models in Dino Hall. Another is an interactive display of the adaptations of cave-dwelling animals compared to their counterparts on the outside. The structure of the cave itself was untouched but the surfaces were scraped, cleaned, and painted. (More than 150 pieces of gum were removed in the process, Might says.) The cave path is the same, but all the lighting is now more energy efficient LED lights and the water systems have been updated and improved. At some places, glass has been removed and railings installed in their place to increase the interaction between visitors and the cave environment — particularly with the large two-story cavern. Display boxes inside the cave are now open for hands-on exploration so visitors can touch and feel the objects on display rather than view them behind glass. The cave exit doors have been rebuilt from the old ones to reflect more honest-to-life cave doors that allow bats to enter and exit without injury. The Cave exhibit has always been a visitor favorite, but it is far more than a casual stroll underground. With a host of added features and updates, visitors will now have a better understanding of how caves are created, cave-dwelling animal life, and the important scientific work that happens inside them.